Me and my wife came on your smallholding for beginners course on Sat 18th April and would like to thank you both very much for your hospitality. We both thoroughly enjoyed our day and found it interesting and very informative, hopefully we will be lucky enough to do something similar to yourselves in the future. Thanks very much. Just to say Thank you so much for our day on Sunday. It was lovely to meet you and all your animals-your highland cattle are beautiful! We gained such a lot of knowledge in such a short space of time! It's really good to learn first hand from someone who is passionate about what they are doing and is able to answer questions with ease and on such a practical level. The folder of information is a great quick fire reference guide which will be invaluable as we get started up. We are definitely all fired up for action now - and can't wait to start! Once again thank you so much for such an informative and enjoyable day. A big “Thank You” for the course earlier in November. It was all we had hoped for and more – perfectly tailored for our needs and much added excitement from the hands-on parts. We are still telling our friends about the exploits of the leaping rams. Please also pass on our thanks and best wishes to all who added to the fun experience for us. Stella, your lunches and cakes were fabulous! We just wanted to say thanks again for a great smallholder introduction day. We really had a wonderful day and loved meeting all the animals. We wanted to also let you both know that the steaks were glorious and the sausages were wonderful! Thanks to you both for a very informative and hands on weekend. We both really enjoyed it and found it very helpful. Sincere thanks to Mike, Stella and the girls for a superb day. 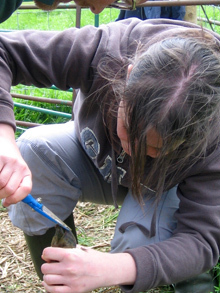 We cannot believe how much was covered on the [Intro to Smallholding] course. We went from having an inspirational, but distant thought of having a smallholding, to a feeling of reality at the end of the day, equipped with sufficient knowledge to source some land and get going as soon as we can! For this we are truly grateful to Mike and Stella. Thank you for sharing your home, knowledge, experiences and animals with us. Fantastic day, would and already have recommended it! I had a really good day [on the pig butchery course]. It was an immensely practical course, very flexible and nicely tailored for our needs; equally ideal for someone with no experience or those who have done some butchery. Everyone was very welcoming. Thanks for a fantastic day guys! Loved every minute of it, to say Brett dragged me there kicking and screaming - I'm so glad he did! I would recommend this course to anyone and will whole-heartedly be doing so! You have a wonderful home, wonderful family and a wonderful lifestyle! Thanks for letting us be a part of it. Thanks Stella, Mike and the girls for a brilliant day. What can I say? Truly a success, even the weather. Thanks for sharing your home, beautiful lunch (hic!) and most importantly your knowledge. Hope to see you again soon, with a post knocker in hand! Thanks for a great day and mega converting Bob...you have really inspired him. As you gathered he's a bit of a petrol head but is moving towards the livestock side of things. I'll be the one doing the nitty gritty but he wants to get more involved which is great. We both love your set up and can now see how we can adapt your system of lambing to suit us and our barn. Thanks again for a brilliant day. Hope to see you in the near future for a couple your girls as Dexters are off the list. Just a quick note to thank you for a fantastic day. My son [aged 9] hasn't stopped talking about getting Highland cows. Been in contact with a few of our local farmers and things are looking good. Found the course content very informative and interesting. You have every avenue covered and it was fantastic to be able to ask questions without feeling uncomfortable. You have a great ability for making people feel comfortable and at ease. 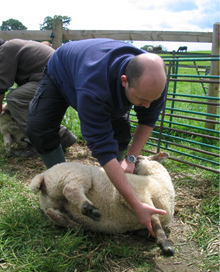 I would highly recommend your course to any one thinking of becoming a smallholder or taking a step to becoming a small farm. And a big thanks for a delicious lunch. Country Smallholding Magazine on Tartan Dragon in August 2014.